Nelson Mandela’s granddaughter, Zoleka Mandela discovered a lump in her left breast little more than a year ago.Zoleka: ‘When I had told my aunt initially, she had told me, ‘You have to go get yourself checked, get a mammogram,’ and so forth. 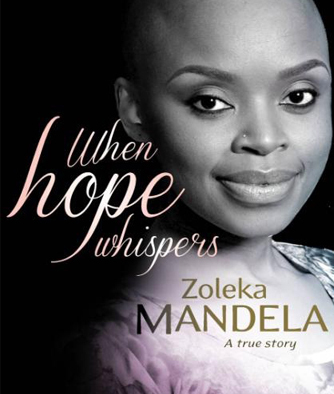 So I always delayed it and delayed it because somehow in the back of my head I thought, ‘If this is cancer, it means death.”Zoleka knew all about the impact of breast cancer, her father’s sister had succumbed to the disease. Known for her beauty and physical attributes, actress Angelina Jolie made a decision to take control of the disease before it took control of her. This is an excerpt from Angelina Jolie’s New York Times editorial in which she made it known that she’d had an elective double mastectomy. The article dominated world news, showing how powerful celebrities personal stories can be. Dr Carol Benn is one of South Africa’s leading breast surgeons. Angelina’s drastic decision was spurred by the fact that her mother had died from breast cancer when she was only 56. Zoleka Mandela was also fiercely protective over her children. But her joy as a parent has been marred by tragedy. Her 13-year-old daughter Zenani was killed after the 2010 World Cup. Almost a year later she gave birth to a three-month premature son, Zenawe, who died in hospital. As if things couldn’t be bad enough, she then found the lump in her breast. Ten-year-old Zwelami is her only surviving son. Zoleka was adamant she had to be there for him by protecting her health. Angelina’s motivation was to protect her children from the trauma she went through when she lost her mother. Oncologist Dr Devan Moodley says the South African gene database is very limited. It’s not a completely reliable test and he says one should be cautious of taking medical decisions based on it. Former TV presenter Janie Du Plessis has graced many magazine covers: she is a breast cancer survivor and like Zoleka Mandela uses her celebrity status to generate awareness. The NGO she supports is Cancervive. Most women know that they should have mammograms every year after turning 40, but Angelina Jolie’s double mastectomy has invoked a fear in some women who feel that they are not doing enough and that they should be considering genetic testing. Genetic counsellor Noelene Kinsley says it costs R8000 to do the BRCA tests. Angelina’s public decision has been criticised because it could set a trend and because it did not stress enough that the BRCA mutation is very slight. Dr Noluthando Nematswerani from Discovery Health says they’ve had enquiries. While Angelina is unlikely to never need chemotherapy, Zoleka has had 16 doses of it. And it needs strong women to put out that message. After the interview Zoleka went to her oncologist and received the news that she’s cancer free.